Ben Sinclair played 63 games for Collingwood, after debuting against Essendon in round 19, 2011. Image: AFL Photos. Collingwood Football Club has today made further list changes ahead of the AFL’s October 31 first list lodgement deadline. Ben Sinclair has chosen to retire from football, while fellow defenders Adam Oxley and Jackson Ramsay have been delisted. The club has committed to select Oxley in the upcoming Rookie Draft should he be available. 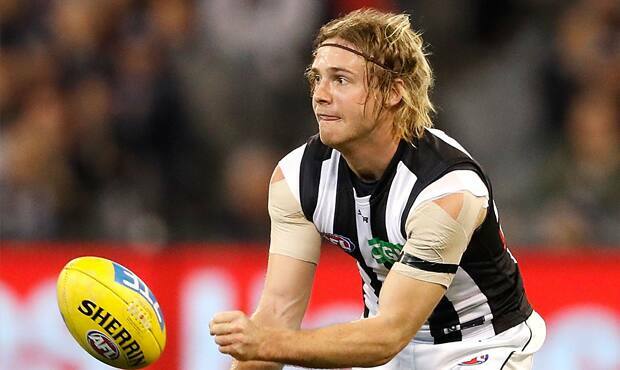 After playing 63 games for Collingwood since being taken at pick No.62 in the 2009 NAB AFL Draft, Sinclair has chosen to step away from the game at all levels in the interests of his health. The 26-year-old overcame a series of concussions in 2016 and was ripe for a return before a serious hamstring injury in the club’s first JLT Community Series match against Essendon ended his 2017 season before it started. Ramsay, 22, also faced an unfortunate run of injuries, managing 17 games in his five seasons at the Holden Centre. The West Australian made his debut for the Pies in Round 2, 2014. Shin complaints curtailed Ramsay’s 2015 campaign and a knee reconstruction cut his 2016 season short. General Manager of Football Geoff Walsh credited Sinclair and Ramsay for their attitude while facing the tough nature of football. “It says something about both men that they shared reasonably long careers with Collingwood despite their numerous setbacks,” Walsh said. “Ben and Jackson were extremely popular teammates who leave us with a lot of friends and goodwill. The game is tough, it can be punishing and it isn’t always fair. Ben, who has had to retire from the game at 26 years of age due to his physical issues, and Jackson understand this as well as anyone. Fellow defender Oxley has played 31 games since arriving at Collingwood in 2012 and will be hoping to bounce back from the hip and groin issues that ended his 2017 season. “Adam’s shown some promising signs over his career and unfortunately due to injury hasn’t always been able to play to the full potential we know he’s capable of,” Walsh said. Adam Oxley is expected to remain at Collingwood as a rookie, if available in the 2017 Rookie Draft. Image: AFL Photos.